After a few arrangatory phone calls in the month beforehand, the morning of 22 February 2012 saw what might just as well be named the Third Plantiac Pilgrimage. At 8:30 I left my Gouda abode and experienced once more the gradual lessening of traffic intensity (and, in the Flevo polders, the local abundance of windmill electricity generators) as I progressed ever further north. At 10:35, The car pulled into an empty parking spot at the Turfkade, about 200 metres east of the former Plantinga-Sonnema (now just Sonnema) Stoombootkade distillery. I had an 11:00 appointment with Sidney Zeegers of the Stichting Bolswards History (Bolsward History Foundation) at their local historic meeting point in an old building at the Grote Dijlakker. It was a very quaint street near the famous Bolsward town hall, opposite what might just be the cutest darn little pizza joint you’ve ever seen, Ponte Vecchio. In the corner of their meeting room sat the computer featuring the Foundation’s digital collection. Before we were able to use it, however, Mr Zeegers needed to cunningly insert a matchstick into a light switch on the other side of the room to prevent it from shorting out and cutting off power to the computer. Like I said: An old building. The foundation’s digital collection consists of hundreds of scans representing meticulously collected photos and picture postcards, ranging from old to very old. 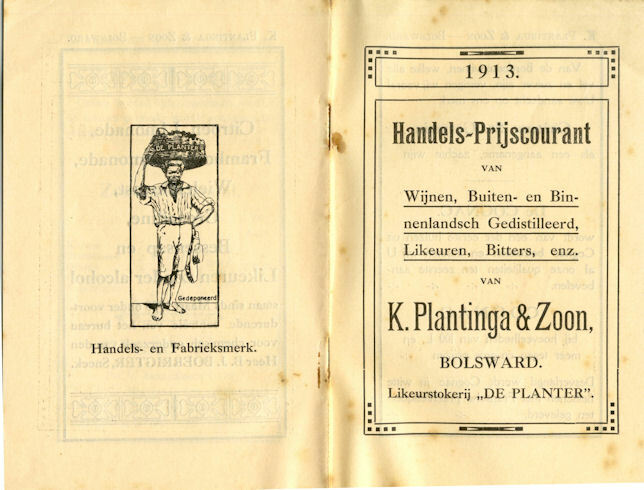 Quite a treasure trove, which I was happy to discover also boasted some relevant material with regard to the Dijkstraat (former Plantinga shop at Nr 7) and Groot Zand (former Plantinga distillery at Nr 6). I could even borrow Sidney’s bike to quickly get my laptop from the car and transfer relevant files to it for later use on the plantiac.nl site. After saying goodbye to Sidney, who was starting to make me think differently about the general gruff nature that people from the North of the Netherlands are said to have, I continued to “Sports 2000 A.P. van der Feer”. This sporting goods store currently occupies Dijkstraat numbers 7 through 11. In the back I found another very helpful Frisian, owner Anne Pieter van der Feer. When he heard I was trying to find out more about the more recent history of house number 7, his wife was called in. Before I knew it, I got a tour of the premises. I was told that he started the sports goods store at a different address in 1966, and moved to the Dijkstraat numbers 9 and 11 in 1973 (he also operated, and still operates, a pet shop on numbers 13 and 15). He saw number 7 – as was mentioned earlier, the Plantinga shop address – rented out to a toy store (either “Speelgoedparadijs” or “Kinderparadijs”) in 1988. When that store moved out, in 1990, he bought the premises. He did some renovation, in particular to the rear of the building. He removed the “K.P. Plantinga & Zn” painted logo from above the shop door, and permanently shut the front door. In the back, which used to be an open garden, there was still the huge water tank. He recalled that thousands of corks (of the kind wedged into big earthenware wholesale jugs of liquor) had been found in it. The premises themselves were now used primarily as storage space for the shop’s large skiing equipment inventory. Mrs van der Feer took me upstairs to the attic, where I saw a heavy-built oak cabinet with many small drawers that used to house the labels for the various products the Plantingas sold. It felt old and historic, and I felt a sense of awe at touching the old piece of furniture that had been used, quite probably, by old Klaas Plantinga, the inventor of Plantiac himself. 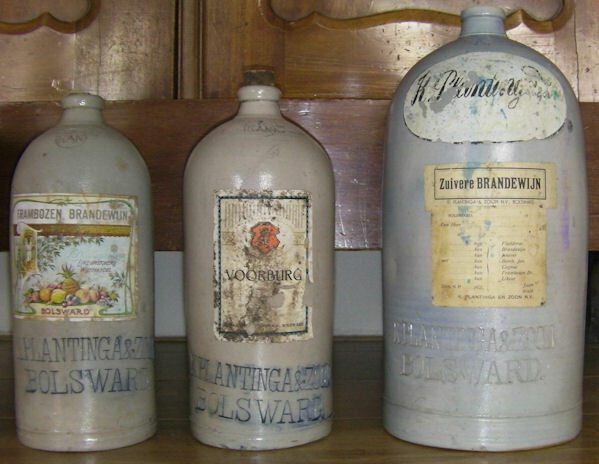 Around a corner in that same attic, she revealed, there had been quite a few old Plantinga jugs with various labels. She had cleaned them up and used them as decoration in her home (which was on the first floor of house numbers 9 and 11). There were a few others still left, which I was welcome to take home if I fancied them. Needless to say, I did. She also permitted me to take pictures of the ones she had in her living room. After bidding a kind adieu to both Mr and Mrs van der Feer, I walked to the Sonnema Distillery. There, I had a 13:30 appointment to be taken up to the visitors centre and generally photograph, scan, or otherwise catalog anything that might have some close or distant bearing on Plantiac, or Plantinga in general. Fellow Plantiac appreciator Stefan Posthuma and me had been in this very same place in June 1991, as it had been subject of the First Plantiac Pilgrimage. I was teamed up with Mrs Willy Boersma, who gave me blank permission to basically do whatever I needed to do with whatever I wanted. She told me I could take pictures off the walls and out of their frames to scan them, and I even got access to a locked display case which contained, among other things, dozens of price list booklets going back as far as 1913. Frankly I was spoiled for choice. For this purpose I had taken my laptop and flatbed scanner with me. I scanned a few of those booklets that seemed to my casual eye to look more interesting, as well as some general pictures that hung on walls here and there. I spent the next hour carefully scanning stuff, treating the nearly 100-year-old-documents with careful veneration, as well as photographing some things that were too big for them to be scanned. Mrs Boersma was by then guiding around a modest group of Dutch and American tourists. The promotional slide show Stefan and myself had witnessed in 1991 had been replaced by a professionally made DVD presentation. As the distillery centres around Sonnema these days, that was what it was about, mostly. At 14:45 I was ready with what had needed to be done, and went downstairs to say goodbye to Mrs Gelkje Schotanus, who basically is the lady running the entire Sonnema operation, and who had been my contact person for this appointment. As I shook her hand and made ready to leave, my eye fell on a display case in her office containing some old and/or rare Plantinga-related bottles. I figured I might as well ask if I could photograph those, which I could and did. We came to talking – about Friesland, Sonnema, Plantinga, corporate restructuring, unique selling points, KP Beerenburg, our backgrounds, and the unfortunate fact that quite a few of her personal Plantinga-related memorabilia were in storage at the moment. We concluded that I should visit again at some later date (say, summer) to have a gander at those items once they’d been unpacked and sorted out again. To tide me over, meanwhile, Mrs Schotanus gave me some rather special items she’d hunted down for me. There was a pack of playing cards with a Plantiac-mentioning back I’d not seen before, and a very unique decorative bottle cap (“sierdop”) that was normally only given to people after having worked 25 years with the Plantinga company. 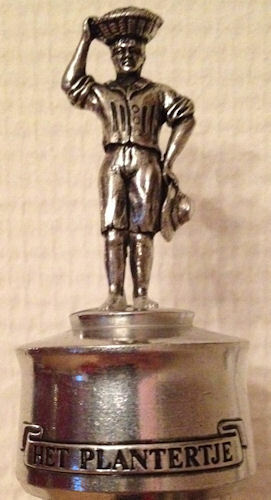 It features a metal figurine of “the Planter” (“het plantertje”, the Plantinga family weapon figure) such as can be seen on Plantiac bottle labels. A rare and special present indeed. Mrs Schotanus turned out to be quite a history buff and was very aware of the importance of the history of brands like Sonnema and, indeed, Plantinga. When I left, I felt secure in the knowledge that any Plantiac/Plantinga-related doohickeys would find their way to her, be kept safe, and would be available for me and others to view in due course. She said she’d get me in touch with the man responsible for just about everything that has ever been done at UTO/Herman Jansen (the Schiedam company – subject of the Second Plantiac Pilgrimage – where Plantiac was made for many years, until the product moved to Boomsma in Leeuwarden in 2005). By that time it was 16:05, and I was already late for my next appointment, with Mr Johan van der Weide. He is the man who became well-known in Bolsward for helping to re-introduce the “Plantinga Beerenburg” (now named “Boalsert KP Beerenburg”), in 2009, after UTO/Herman Jansen had discontinued production in 2001. He also happens to live right next to the former Plantinga Distillery which was located at Groot Zand number 6 (a fact he did not know until after he saw it on the plantiac.nl site :-). Johan and Mrs van der Weide, retired horticulturist and ceramics artist respectively, bade me welcome and immediately bestowed on me a small wooden authentic Plantinga crate with various more or less Plantinga-related paraphernalia. 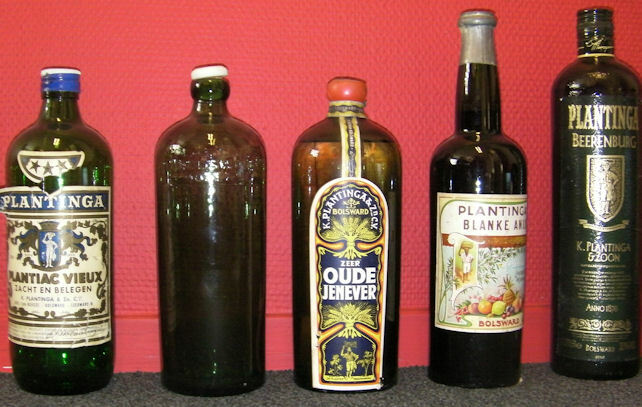 There were newspapers clippings related to Plantinga and/or the Dijkstraat/Groot Zand premises, some empty Beerenburg bottles, some KP shot glasses, a variety of Sonnema-related swag and, very interestingly as far as I was concerned, a half-litre bottle of Plantiac with the old-style label. Half the contents were even still in it, though probably not very consumable anymore after what must have been around 30 years. 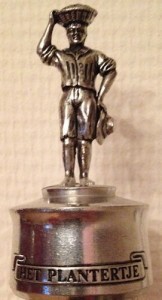 They also had a rather tall (about 60-70 cm) jug from the old Plantinga distillery that I could photograph. When I had questions about the house next door they just went and got the neighbour. He brought along his collection of photos that he had taken around the time when he purchased the building (in 1977), and during the process of converting it from a pretty-much-about-to-fall-apart old distillery into a place fit to actually make your home in (which he has done since 1980). They drank some Boalsert KP Beerenburg while I scanned the neighbour’s pictures. I still needed to drive, obviously. 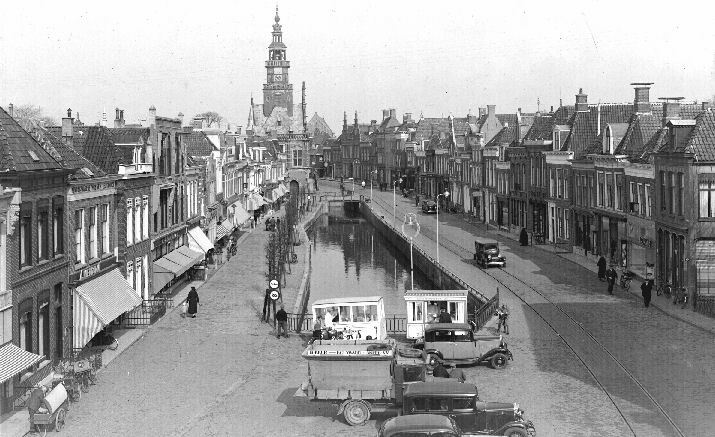 I nearly forgot that I still needed to go to the local public library (literally around the corner, at Marktplein 1) where I had been in touch with one of the librarians about a book which featured some interesting photographs related to Plantinga, Dijkstraat and Groot Zand. I arrived at 17:40 and the library was going to close at 18:00 on the dot. I set up my rig again and, with the aid of another friendly library lady, was able to quickly home in on the right books and scan some rather cool material. After leaving the library I decided to visit the local Jumbo Kooistra, the off-licence where they sell Boalsert KP Beerenburg and where I figured they’d also sell Plantiac. And, indeed, they did. At 18:35 I paid € 12,50 for a bottle of the Divine Fluid and programmed Tom-Tom to take me home. As it once more wanted to send me through the Flevoland polders, I neglected the initial few instruction and headed for the Afsluitdijk instead, just like with the First Pilgrimage. Tom-Tom recalculated and directed me via Amsterdam. There was a bit of a storm going on as I crossed the Afsluitdijk, with violent rains lashing, the car being pulled left and right by gusts of wind. In Wieringerwerf I fueled up the car at a record-popping € 1,799 cents per litre (for Euro 95 petrol). At 20:15 I pulled into the parking lot in front of our house and I was home again. Home, after what had been a very insightful and special day up North. After having been ever more fed up with the way Google refuses to properly spider my personal site, and after consulting my stepbrother’s VUWKH (Virtually Unlimited Web Know How), I have spent this evening upgrading my site to WordPress. I will probably blog a little more from now on, what with there being a Facebook uplink too.